Random Korean always makes things look more authentic doesn't it? 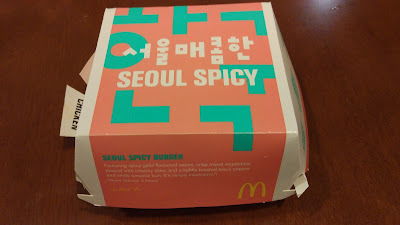 The Wife and I ended up in Singapore over the last couple days which allowed us to catch the tail end of the "Seoul Spicy" promo burgers that have been sold for most of March. I knew from my time living in Singapore that promos usually run about a month, so they should disappear pretty soon. 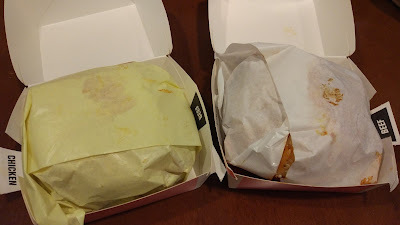 Since The Wife was with me I was able to try both variants of the burger, Chicken and Beef. 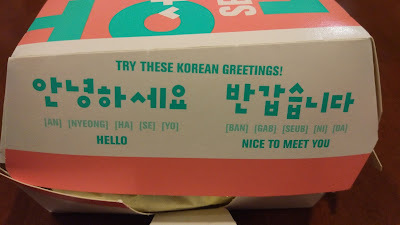 Long time readers will know that prior to moving to Thailand and even Singapore, I was based out of Korea for a couple years, so I was rather interested to get a foreign-McDonald's take on Korean food. Why not learn some Korean with your dinner? Now I'm not reviewing these separately because apart from the meat, the rest of the burger was identical between the two, so it doesn't really warrant two individual reviews this time. 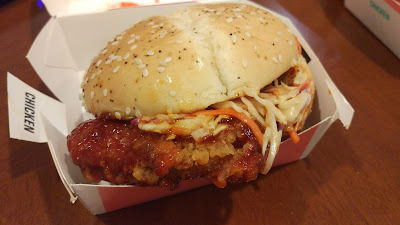 The Chicken comes from the McSpicy which I reviewed years ago, and is one of my most "popular" reviews as I get frequent feedback from Singaporeans saying my opinion on the burger is completely incorrect. 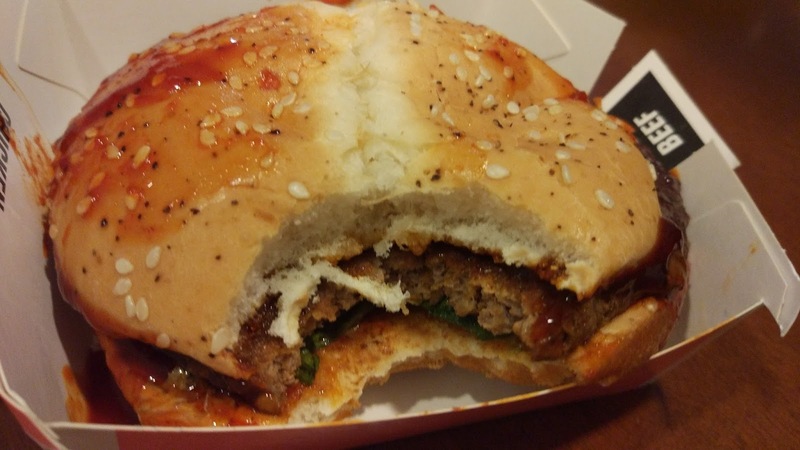 The beef patty is taken straight from a Quarter Pounder. The rest of the burger is where it gets interesting as each other ingredient is special for this specific burger. 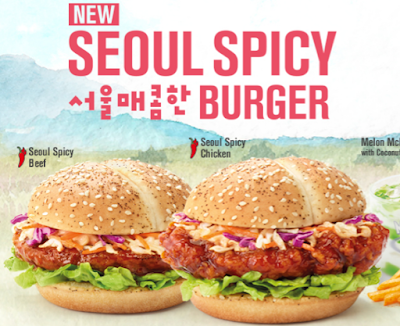 The bun is a black pepper and white sesame topped 'premium' bun which is a bit thicker than a traditional bun for a burger of its size. 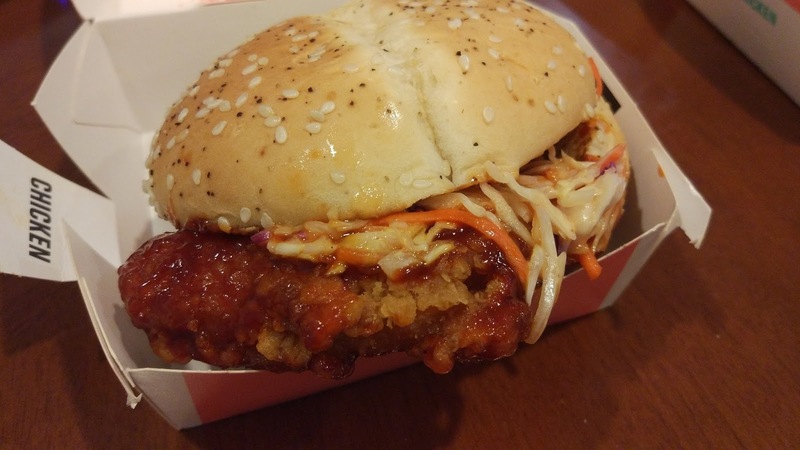 The veggies used were white and purple cabbage with carrot which were then tossed with mayo to make a "slaw", something that was similarly used in the Apple Slaw burger I was able to review last year. 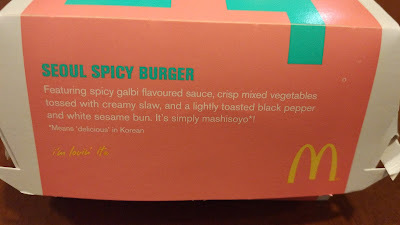 but the real "Korean" flavour comes from the sauce, and that's the real star of the show here. Both the Beef and Chicken burgers that I received were covered in an absolutely ridiculous amount of sauce. They were wrapped in paper before being placed in the box, but each paper wrapper was covered with sauce, which meant the burger had sauce both inside, outside the burger. I would say that both probably had 3-4 times the necessary amount of sauce needed. There was actually so much sauce that it was difficult to take a pleasant looking photo for the blog since they looked mostly like a wet sloppy mess. 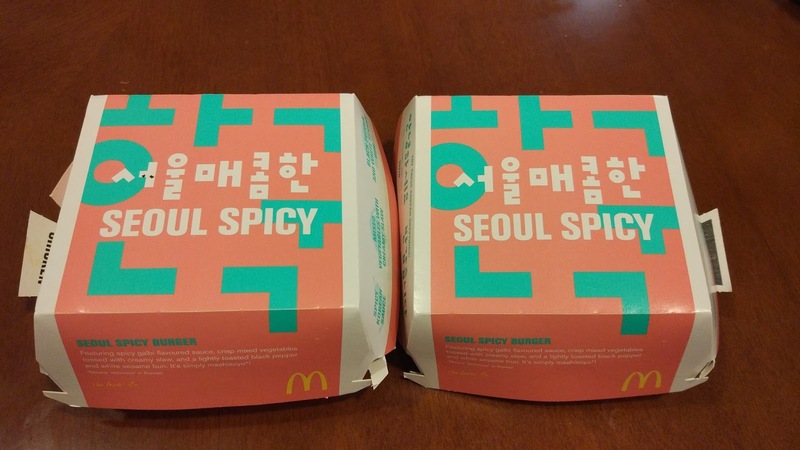 I wasn't able to find a manufacturer of the sauce, so I'm not sure if it actually came from Korea (but being Singapore - most likely China). 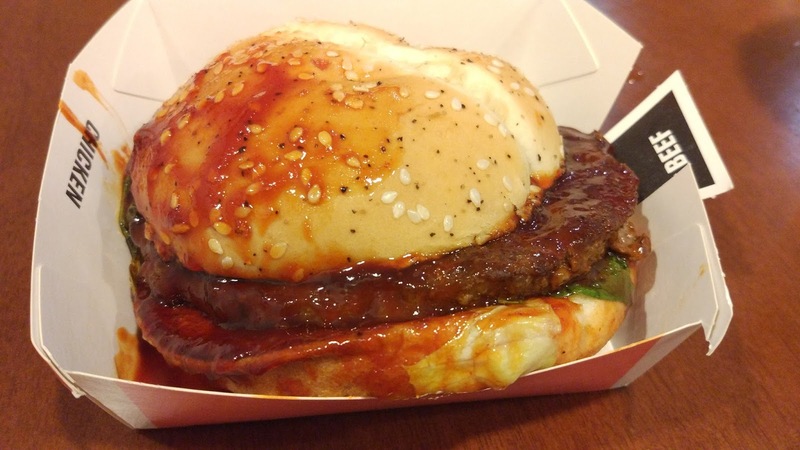 The sauce was being promoted as a "galbi" sauce, which are marinated short ribs typically found at Korean BBQ places. 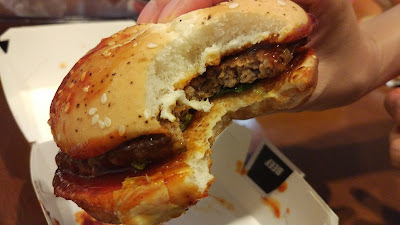 The Korean Wife (same as The Wife), after her first bite said the sauce didn't really remind of us galbi marinade at all, and couldn't really place it to anything specific, but it had a basic Korean 'flavour' I personally thought it tasted like another sauce used on certain variants of Korean fried chicken, but The Wife shot that idea down. 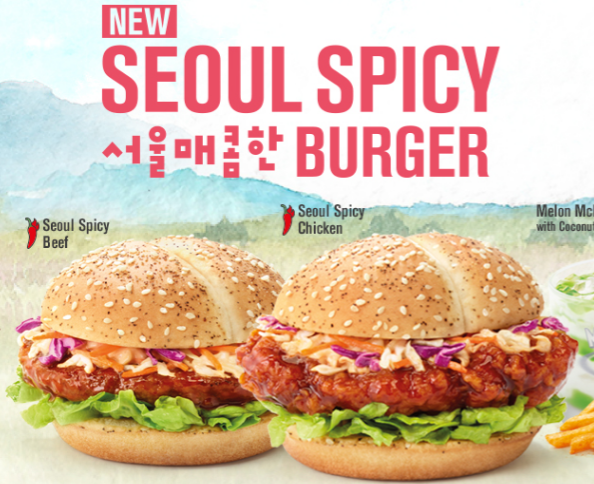 The PR release from McDonald's Singapore said it includes traditional Korean ingredients such as fermented soy bean paste, sesame paste, soy sauce, chilli peppers, red paprika and garlic. 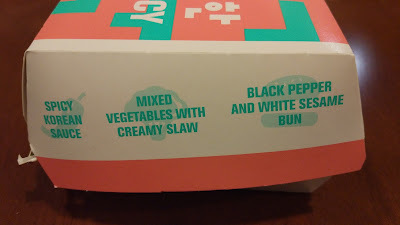 Both of us thought it was good, but there was just something not quite 100% Korean about it. Same goes with the choice of veg toppings - sure Korea uses cabbage, but the cabbage/carrot mix isn't something you'd find in Korea, nor on burgers in Korea. When I lived in Singapore, McDonald's was clearly on a "spicy" kick as every other promo burger was some kind of new spicy sauce. Since moving to Thailand, a land full of spicy food of its own, I haven't had that many spicy McDonald's items over the last couple of years. 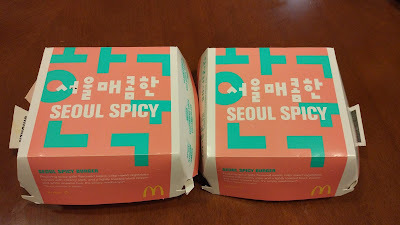 I used to always say McDonald's Singapore rarely had properly spicy items, but this Korean sauce used had not only a nice flavour to it, but a surprising kick to it. 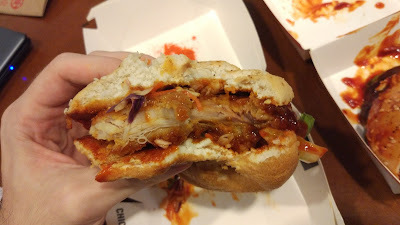 This leads me to my last point about this burger, which was better, Beef or Chicken? 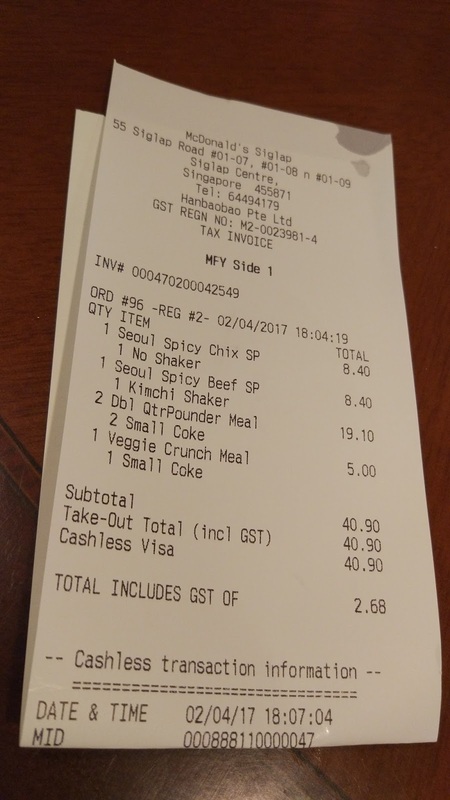 If I were by myself and not sharing with The Wife, I likely would have gone for the Beef as I like to avoid eating Fried Chicken when I can, but in this case the Chicken variant was the clearly better burger. Since I felt that the sauce reminded me of Korean Fried Chicken sauce, naturally, I felt that the sauce being used on Chicken was simply the smarter combination. Also, since the it used a McSpicy patty, that meant the patty itself had more spice in the patty, and I'm one of those people where spicier is usually better, so that was another plus in my book. 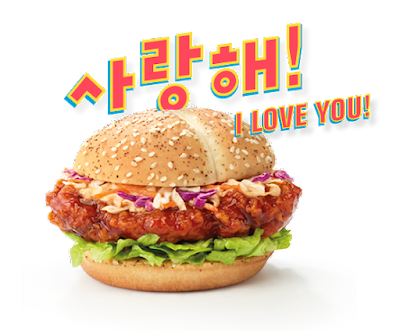 Despite not being 100% authentic "Korean" it still was Korean enough to not be laughably different, and the burgers still held their own flavour-wise as well so both were solid entries, deserving decent scores. If you want to check out some reviews from real Korea click here. I like your honest review!